This past Saturday I spent the entire day in the kitchen. Pure hurricane heaven! I was so excited to have power that I went a bit overboard. I made homemade pesto, pasta sauce, Millionaires Shortbread and Risotto. 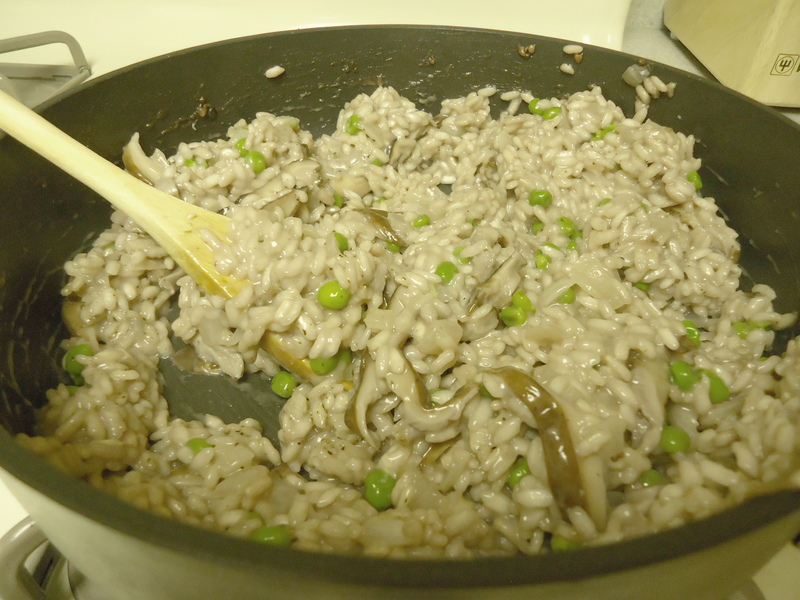 A word of caution, risotto is something that requires time, time and a LOT of stirring. Don’t worry, there’s a delicious payoff in the end. Heat the chicken broth in a small pot over low heat and cover. In a large pan, melt the butter and add chopped onions. Cook until tender and translucent in color (approx 8 mins). Add your chopped shitake mushrooms and garlic then saute until the mushrooms are tender (approx 10 mins). 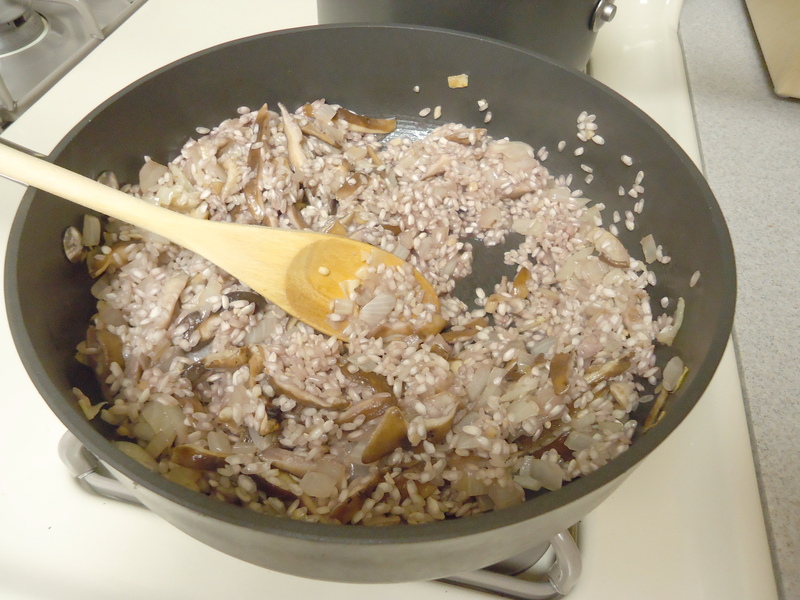 Add the rice and wine to the pan, and stir until the wine is absorbed. 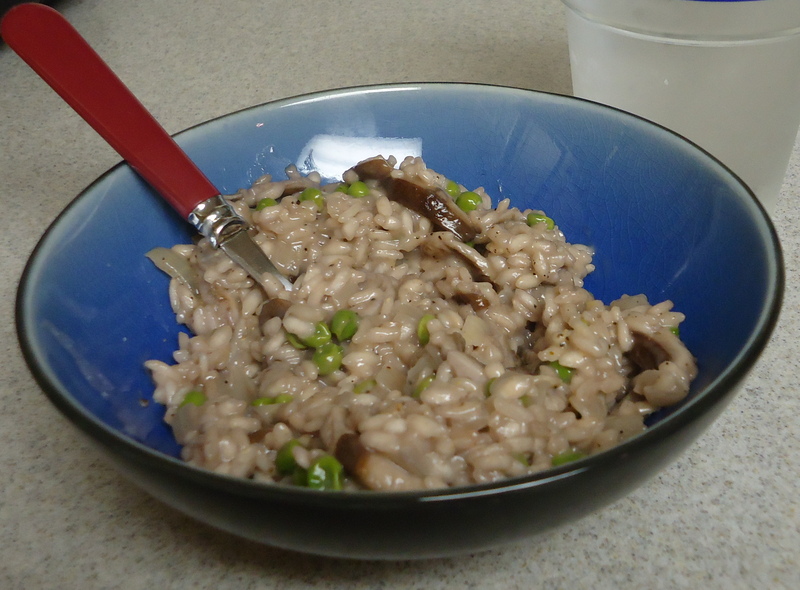 Yes, I recognize that risotto is typically made with dry white wine, but I had red, and was not willing to brave the storm under any circumstances. Add a cup of the warm broth to the pan. Stir frequently until the liquid is absorbed. At this point your risotto should look like this. Patience! Your rice will still need a lot of stirring but you will get there. Gradually add the second cup of chicken broth to the pan, stirring constantly until absorbed and add in your frozen peas. Then, you guessed it, add the final cup of broth to the pan and…stir. The whole stirring and adding broth process will take about 30 minutes. You will know you are finally finished stirring when the risotto has a creamy consistency, and the last bit of liquid is absorbed. See the picture below. Now add salt and pepper to taste, and then stir in the parmesan cheese!!! Final step-grab a spoon and dig in. Well worth the wait right?